Just three days may not be enough to see and savour all the sights, sounds and flavours of this most western of Russian cities. Our guide to this Russian enclave will showcase the best Kaliningrad has to offer. Kaliningrad is the western-most Russian city, situated 1263 kms away from Moscow. Its relatively small size belies its rich, vast and varied historic past. Kaliningrad (once known as Koenigsburg) has been, variously, part of Prussia, Poland and Germany, from which it was absorbed into the Soviet Union at the end of the Second World War. These influences become apparent during a walk around the sea-port town on the Baltic Sea, particularly in the architecture, which is reminiscent in places of a medieval German town, with a sudden move into a Soviet-style market place. Wandering through the streets of this town where he lived, the eminent philosopher and thinker Emmanuel Kant was perhaps inspired to write the Critique of Pure Reason. 1. 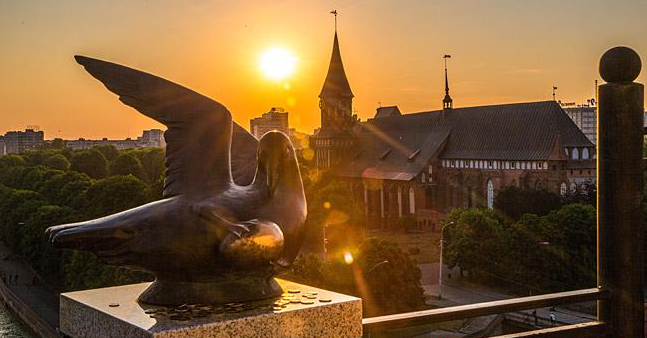 High on the list of must see sites in Kaliningrad is the the Koenigsberg Cathedral. This Gothic-style cathedral with a brick façade on Kant Island (earlier called Kneiphof) on the Pregel (Pregolya) River was dedicated to the Virgin Mary and St Adalbert. The cathedral now has two chapels, one Lutheran, the other Russian Orthodox, and a fascinating museum. Kant’s tomb is located in this cathedral, making it the ideal place to ponder over the meaning of life, perhaps. 2. A short yet very scenic walk away is the 'Fishing Village', a modern set of buildings and other constructions that take you back to 17th century Germany. While the ‘village’ is a relatively modern construction, it is actually located on the site of a former German fishermen’s settlement. On a balmy summer day, a boat trip around the river is highly recommended. Before stopping for lunch at one of the good, and very reasonably priced, restaurants (considering this part of the city is a prime tourist attraction), burn some calories by climbing up to the top of the Lighthouse Lookout Tower. 3. Kaliningrad is also famous for its numerous beautiful city gates. Walking around to see them all would take the greater part of the day so, if 72 hours is all you have, renting a bike is recommending. The other option is to walk around and see a few of the most impressive ones, like the King’s, Friedrichsburg and Friedland (also a museum) Gates. 4. Kaliningrad boasts several lovely parks so if the weather smiles down on you pay a visit to the Botanical Gardens founded in 1904 by German botanist Paul Keber, the Kaliningrad Zoo or the Central Park of Culture and Recreation which has lots of rides and attractions for kids, as well as cafes and sometimes musical events. 5. If it happens to be a rainy or cold day take refuge in one of the many museums. The region is best associated with amber so unsurprisingly the city’s Amber Museum is one of the most visited museums and Russia’s first and only amber museum. Apart from having all things amber, it is also housed in a fortress tower dating from the mid-nineteenth century (and the ideal place for getting souvenirs for friends and family back home). Other important museums include the B-413 Submarine Museum, Museum of the Ocean World and Kaliningrad State Art Gallery. 6. This is sure to work up an appetite so for some dining ideas check out our guide to eating to eating like a Kaiser in Kaliningrad. 7. No trip to Kaliningrad is complete without exploring the 46km of Russia’s part of the majestic Curonian Spit with its sand dunes and unique ecosystem. How you do it is up to you. Some prefer sticking with one of the many tour operators that will take them to the most important sites accompanied by information, while others rent a car and stumble upon remote spots that tour groups skip. 8. If you opt for the car rental option, a perfect way to finish the day is driving about an hour westwards to see the sun set over Baltiysk, Russia’s westernmost city and major naval base of the Baltic Fleet, and wave hello to Poland! 9. After two days of active exploring we highly recommend you get some beach and relaxation in, especially if it’s summer as the Northern sun can get unexpectedly strong. The region’s most popular resort towns are Zelenogradsk, Pionersky and Svetlogorsk– all about one hour commute out of Kaliningrad. Though the water never gets as warm as the Mediterranean, it offers a very refreshing relief during the summer heat. Even if you’re visiting during the cooler months, this still makes for a very pretty and relaxing day trip. 10. Good surf schools, a developed infrastructure, sandy beaches and a decent pier make these places an excellent location for surfing.